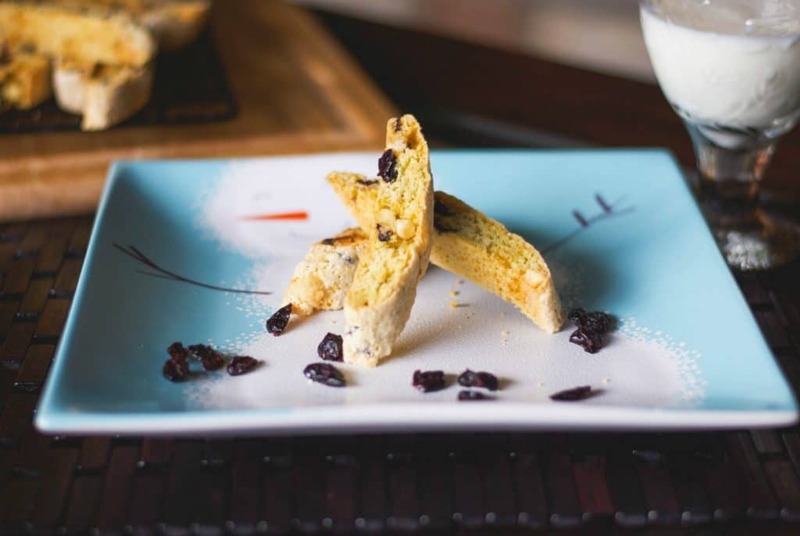 White Chocolate Blueberry Biscotti is an Italian cookie that’s crunchy and sweet at the same time and make a tasty addition to holiday dessert platters. 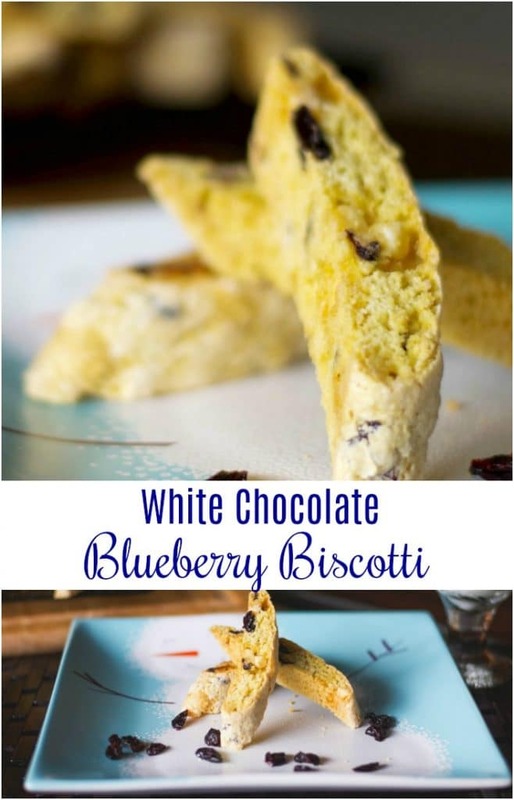 I originally shared this recipe for White Chocolate Blueberry Biscotti back in 2012, but they’re so good and easy to make that I had to update this post. Especially this time of year when we’re all looking for some new recipes to add to our holiday baking platters. 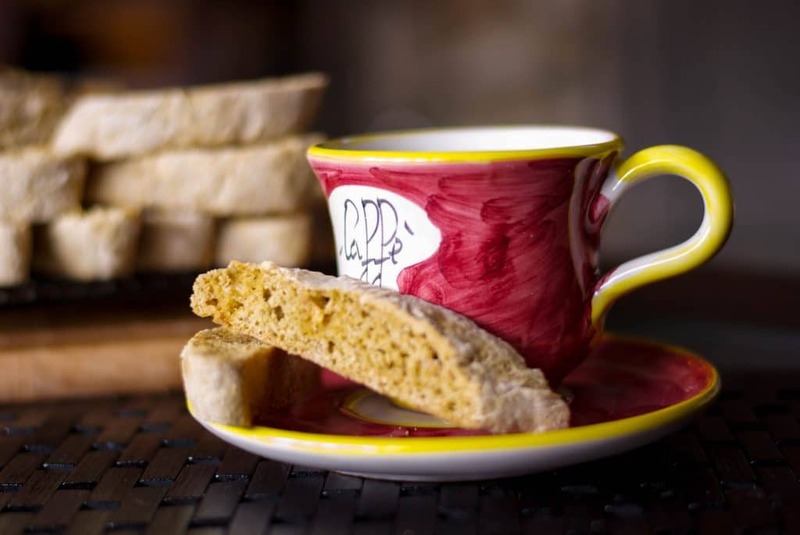 Biscotti is the perfect dessert (in my opinion!) 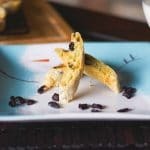 because its not too sweet, has a little crunch and goes perfectly with a cup of coffee or tea. I could eat them for breakfast or an afternoon snack. 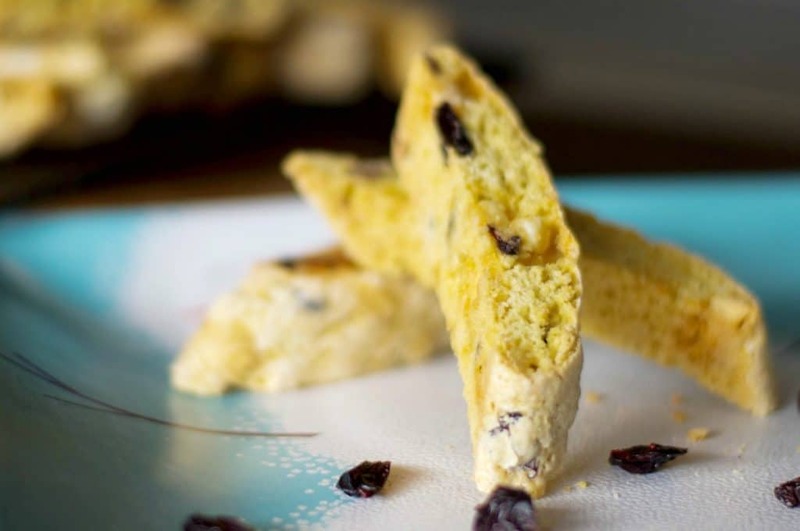 Each year around the holidays, I try to make some new flavor combinations to give us a variety and this year it was the Sea Salt Dark Chocolate Cherry Biscotti, but these White Chocolate Blueberry Biscotti are probably one of our favorites! 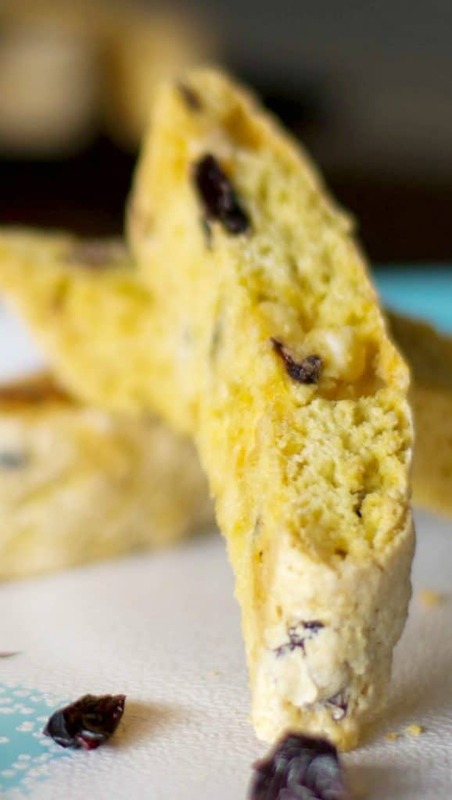 To make the biscotti, you’ll need flour, sugar, baking powder, baking soda, vanilla extract, eggs, dried blueberries and white chocolate. You can either use chips or chopped white chocolate. First, combine the dry ingredients in a mixing bowl until well blended. In a separate bowl, whisk together the eggs and vanilla; then add the egg mixture to the flour mixture. Mix well until all of the ingredients have been incorporated; then fold in the blueberries and chocolate. Turn the dough onto a lightly floured surface and knead until the dough is no longer sticky; then form two, 12” long log shapes and flatten down so that it is no higher than 1-inch. Spray a baking sheet with cooking spray or line it with parchment paper, add the two pieces of dough and bake at 325° F for 30 minutes. 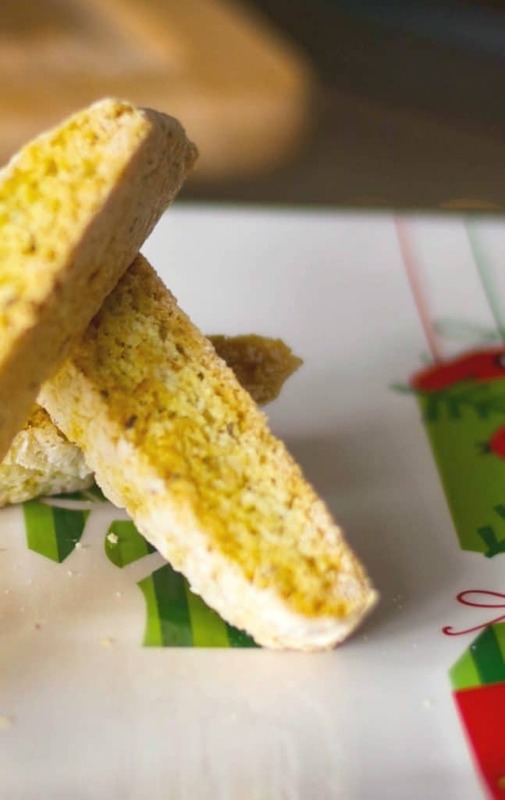 Next, remove the biscotti from oven and let cool for about 5 minutes; then slice diagonally into 1/2″ thick slices. Place the pieces back on the baking sheet and bake for an additional 8-10 minutes per side. They want to be light brown; then remove from the oven and let cool. 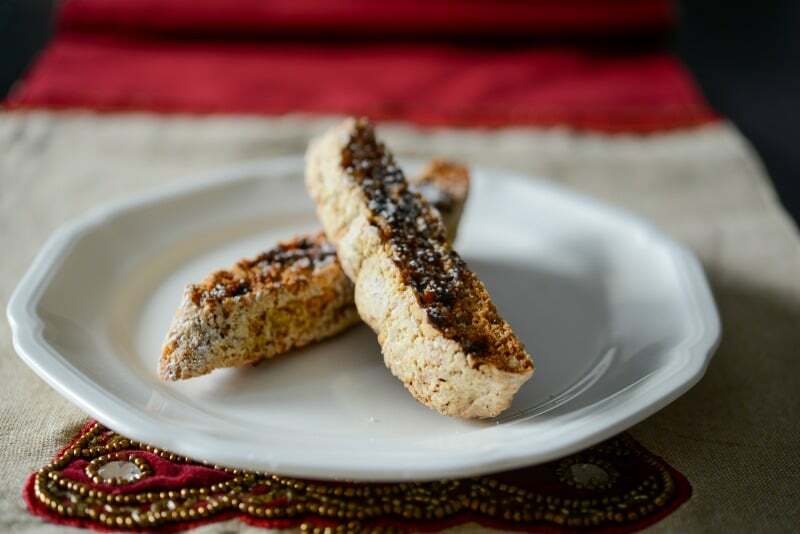 Store the biscotti in an airtight container at room temperature for up to 2 weeks or you can freeze it in a resealable freezer bag for up to 3 months. 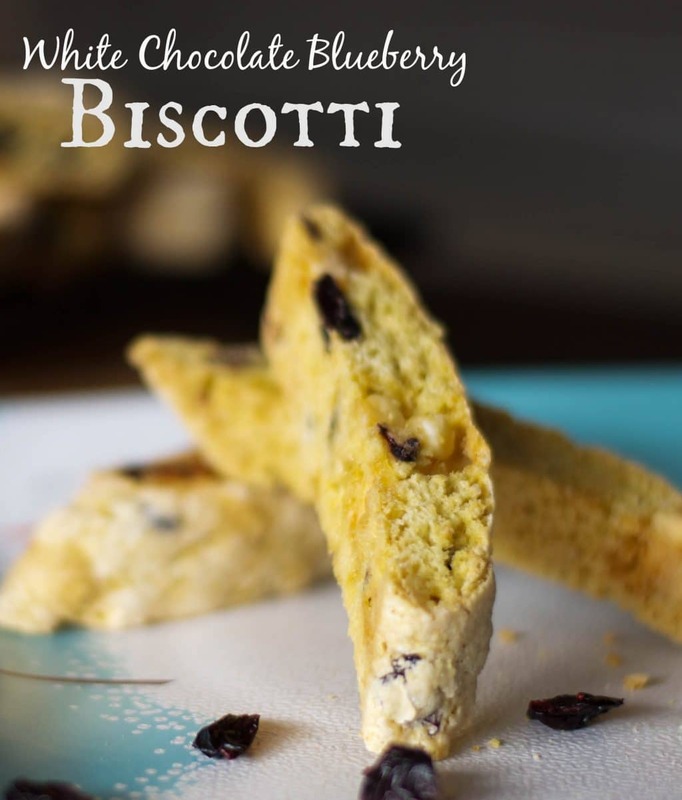 This recipe for White Chocolate Blueberry Biscotti makes approximately 2 1/2 dozen Italian cookies and my family really enjoyed these. I didn’t make them this year, but I will after the holiday dust settles and we’re looking for that little something sweet to pick on because they’re SO good! ~ Enjoy! 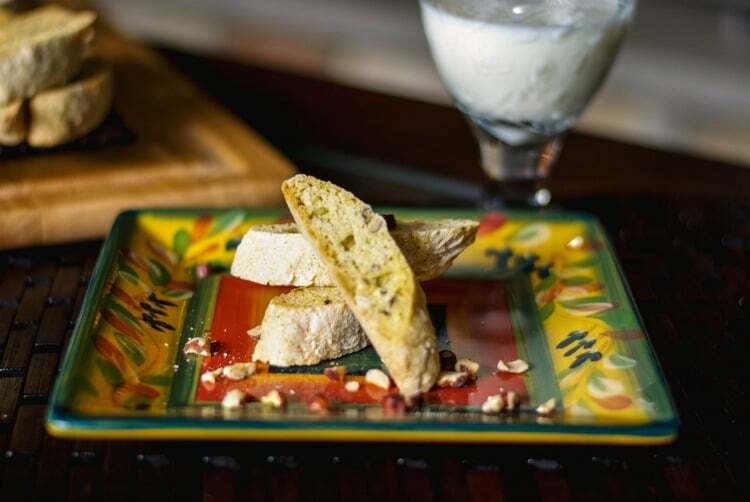 White Chocolate Blueberry Biscotti is an Italian cookie that's crunchy, sweet and make a tasty addition to holiday dessert platters. In a bowl, combine the flour, sugar, baking powder, and baking soda until well blended. In a separate bowl, whisk together the eggs and vanilla. Add the egg mixture to the flour mixture and mix well until all of the ingredients have been incorporated. Next, fold in the blueberries and chocolate. Turn the dough onto a lightly floured surface and knead until the dough is no longer sticky, then form two, 12” long log shapes and flatten down so that it is no higher than 1”. Spray a baking sheet with cooking spray or line with parchment paper; then add the dough and bake at 325° F for 30 minutes. Remove from oven and let cool, then slice diagonally into 1/2" thick slices and put them back on the baking sheet. Bake an additional 8-10 minutes per side, then remove from the oven. Allow to cool completely before storing in an airtight container at room temperature for up to 2 weeks or in the freezer for up to 3 months. Makes 2 1/2 dz. For more dessert recipes, visit the Dessert category under the Recipe Index or my Dessert & Snack Recipes Pinterest board! *Originally shared December 2012/Updated December 2018.